Sustainability and Multicapitalism — Together at Last! - Sustainable Brands Sustainability and Multicapitalism — Together at Last! Sustainability and Multicapitalism — Together at Last! Published 5 years ago. About a 7 minute read. Late last month, the International Integrated Reporting Council (IIRC) and the Global Initiative for Sustainability Ratings (GISR) announced their signing of a memorandum of understanding (MOU) in which the two groups pledged to work together to promote and support the global alignment of corporate reporting and ratings frameworks. This announcement is of particular importance because more than any other international standards for sustainability measurement and reporting, the IIRC and GISR standards have made conceptual commitments to the capital-based interpretation of sustainability. The capital-based approach is one that interprets the sustainability performance of an organization in terms of what its impacts are on vital capitals. 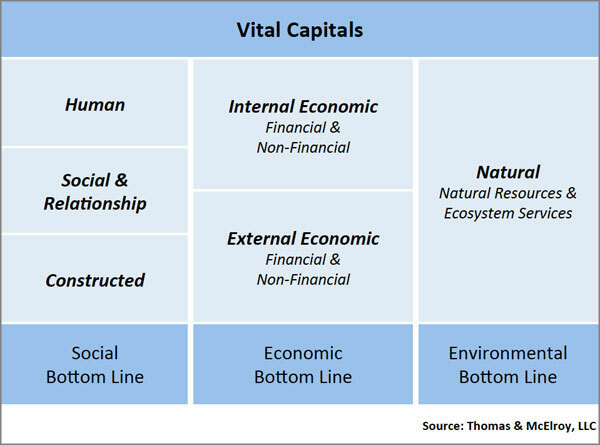 Vital capitals, in turn, are resources that people (and non-humans alike) rely on for their well-being. To put them at risk or fail to maintain them is, in a word, unsustainable. Thus, if there is one thing in the sustainability literature that most scholars agree on, it is the capital-theory basis of the concept. Human activity is either sustainable or not depending on what its effects on vital capitals are. That much is clear and it’s high time our measurement and reporting standards in commerce explicitly acknowledge as much. Human Capital: This is the world of individual people and their individual assets (i.e., knowledge, skills, health, ethical entitlements, etc). Individual Intellectual Capital is therefore also included in Human Capital. Social & Relationship Capital: This is the world of teams and networks of people working together to achieve common goals or cooperate with one another in mutually beneficial ways, and also the shared or mutually held knowledge they rely on to do so. It, too, therefore also includes Intellectual Capital, albeit of a shared or mutually held kind. Constructed Capital: This is the world of designed artifacts (human-made material things, that is). It is sometimes also referred to as Built or Manufactured Capital and also tends to include embedded Intellectual Capital. Economic Capital: This is the world of both financial and non-financial resources that contribute to the economic well-being of people. It therefore includes what is sometimes referred to as Financial Capital and also certain codified forms of Intellectual Capital (e.g., patents, trademarks and copyrights). Natural Capital: This is the world of natural resources and ecosystem services, sometimes also referred to as Environmental or Ecological Capital. Included in the summary above, then, are all of the capital types otherwise found or referred to in the IIRC and GISR frameworks and in the capital theory literature in general. It is no small matter that this essential element of sustainability theory and practice is now openly recognized in leading international standards for measurement and reporting. The fact that the two players who now do so (IIRC and GISR) are now joined at the hip is of enormous importance, as it can only serve to accelerate and make more prominent the capital-based interpretation of sustainability. The multicapital orientation to sustainability in commerce, that is, is now finally coming of age! What, then, are the practice implications of what we might call Multicapitalism? If the sustainability performance of an organization is a function of what its impacts on vital capitals are, and if the international standards for integrated reporting and ratings are now being expressed in capital-based terms, corporate sustainability managers, it seems, ought to be orienting themselves accordingly – towards the business of managing their organizations’ impacts on vital capitals. To be clear, sustainability management is capital impact management! Most of what passes for mainstream sustainability management, however, is not yet capital-based. On the other hand, one branch of practice is and always has been: context-based sustainability (CBS). Indeed, it is quite possibly the case that the only approach to sustainability management that explicitly complies with the capital basis of the IIRC and GISR frameworks is CBS. And whereas the IIRC and GISR frameworks were only recently released in late 2013 and early 2014, respectively, CBS has been in use since at least 2008 and is demonstrably the most comprehensive and robust implementation of Multicapitalism in existence today. That said, most implementations of CBS to date have been exclusively non-financial in scope. CBS by design, that is, has been mostly about measuring, managing and reporting the sustainability performance of organizations, where sustainability is defined in purely non-financial (usually social and environmental) terms only. In that regard, only impacts on human, social and relationship, constructed and natural capitals have been taken into account by CBS, and not impacts on economic capitals commonly associated with financial performance. Here one could say that sustainability management has been mostly about the social and environmental bottom lines and not the economic bottom line at all. More recently, however, an attempt has been made (with good success) to finally expand CBS into the realm of financial performance resulting in the world’s first comprehensive context- and capital-based Triple Bottom Line (TBL). This is known as the MultiCapital Scorecard™ (MCS) method, and with it has come the formal addition of economic capitals to the non-economic capitals otherwise already ensconced in CBS. What both CBS and the MCS have in common, therefore, is their shared commitment to impacts on vital capitals as the core determinant of whether or not an organization’s activities are sustainable. That is their fundamental theory of practice. By following a specific protocol to first determine what an organization’s impacts on vital capitals must be in order to be sustainable (i.e., to define company-specific sustainability thresholds), actual impacts on the same capitals can then be managed and assessed relative to the same criteria. The MCS simply adds consideration of impacts on economic capitals to those already being considered for assessing social and environmental performance and for the very first time, truly integrated (i.e., TBL) capital-based management then follows — compliments of CBS! "Current well-being has to do with both economic resources, such as income, and with non-economic aspects of peoples’ [lives] (what they do and what they can do, how they feel, and the natural environment they live in). Whether these levels of well-being can be sustained over time depends on whether stocks of capital that matter for our lives (natural, physical, human, social) are passed on to future generations … it is good practice to first start by elaborating a common language or a common general framework. The one that we have tried to emphasize is the so-called 'stock-based' or 'capital-based' or 'wealth-based' approaches to sustainability." Happily, capital-based international standards for sustainability measurement, reporting and ratings are now coming to the fore. Sustainability and Multicapitalism, that is, are together at last!